Tour beautiful Lake George with an expierenced and licensed guide! Tube behind the boat, go cliff jumping or plan a pic-nic on an island. Sorry, no images to display! 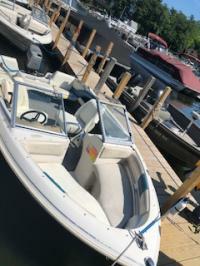 18'-22' Bowrider for cruising the lake, skiing/tubing/wake boarding and island camping! 19' Bowrider. Great for all watersports! This boat is ideal for larger groups or groups that have a lot of gear to transport. These boats are ideal for camping. 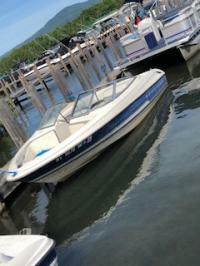 Cruise the lake in a brand new tritoon from Towboat Lake George LLC. The extra pontoon in the middle of this boat gives it extra stability. Our midsized tritoon is perfect for touring Lake George. Big family? No problem here! Fit up to 20 people on our 30' tritoon. Add a tube, skis, or a wake board to your rental!